A Zika-related stillbirth case in Brazil has doctors concerned about additional risks of the Zika virus to babies besides microcephaly, like other birth defects. Zika presents a real danger to pregnant women, as the virus spread by mosquitoes has been linked to microcephaly, a condition marked by a smaller than normal head, a brain that may not have developed properly, and vision problems. 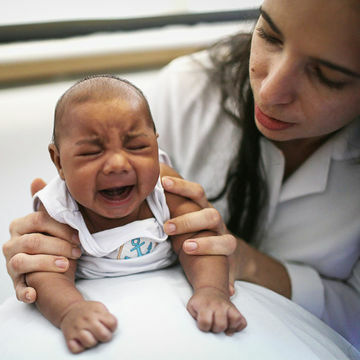 But now, scientists have reported a case in Brazil of a baby infected with the virus who also had additional birth defects including hydrops fetalis (an abnormal accumulation of fluid) and hydranencephaly (absence of brain tissue), which resulted in stillbirth. The researchers published their case report in the journal PLOS Neglected Tropical Diseases. The case is significant because it's the first to suggest that Zika might have wider implications for unborn babies. So far, it's been thought that it affects the central nervous system, as microcephaly does. "What is different about this case is that it caused fetal hydrops, which suggests that the Zika virus may cause damage to tissues in addition of central nervous system," Antonio Raimundo Pinto de Almeida, M.D., of the Hospital Geral Roberto Santos in Salvador, Brazil, who led the research with Albert Ko, M.D., at Yale School of Public Health, tells Fit Pregnancy. Could this baby's additional birth defects just be a coincidence? Dr. Almeida says no. "We of course had to rule out many other conditions associated to fetal hydrops, and we did it," he says. More research is needed, though, to confirm that this is not an isolated finding. In addition, sadly the baby died in the womb and was delivered at 32 weeks, giving more support to the notion that the Zika virus can be fatal. "This case does provide additional evidence that congenital Zika infection can cause fetal demise," Dr. Almeida says. "Two other cases were reported in MMWR [the CDC's Morbidity and Mortality Weekly Report] this year." Dr. Almeida says he does not have any additional recommendations for pregnant women at this time based on this one case. "For pregnant women, the WHO and CDC recommendations are very good with the knowledge we have," he says. "But we thought it was important to alert the health community." He and his colleagues are recommending that a systematic investigation be undertaken on the connection between miscarriages and stillbirths and the Zika virus. "This is a single case report but to date we are not aware of studies in [miscarriages and stillbirths]," he says. "We are currently also studying fetal demise in our hospital on the top of microcephaly and other problems related to Zika." In the case Dr. Almeida and his colleagues looked at, a 20-year-old woman was experiencing a normal pregnancy until an ultrasound at 18 weeks revealed the baby was much smaller than normal. As her pregnancy progressed, the birth defects were diagnosed, and labor was induced at 32 weeks due to fetal demise. The baby was confirmed to have the Zika virus, although the mother never had any signs of Zika (80 percent of cases have no symptoms). The current recommendations for pregnant women and women trying to get pregnant are to avoid areas where the virus is spreading, which includes countries in South America, Central America and the Caribbean. Women whose partners have traveled to those areas should use protection because Zika can be transmitted sexually. Although there have been cases in the United States, none of them have been transmitted by local mosquitoes. However, if people bring back the virus from other areas and then are subsequently bitten by local mosquitoes, who in turn bite other people, it's possible the virus could spread. But the CDC says they do not expect a widespread outbreak in the U.S., even though there is not yet a vaccine. Unfortunately, not much has been proven yet about the effects of Zika on unborn babies, but precautions should be taken just in case. "Everything is new, and this raises more questions than answers," Dr. Almeida says of the recent case. "The research is moving very fast."